I often get asked how I make my paper or papier mache paste. The only time I've posted my recipe was in the middle of one my projects and have just referred back to that project ever since. Today I'm going to share it in a stand alone post to serve as an easy go-to reference not only for you guys but myself as well. Without further ado, here it goes. Put 4 parts water into a pot on the stove and bring it to a boil. While you are waiting for it to boil, mix 1 part flour to 1 part warm water. 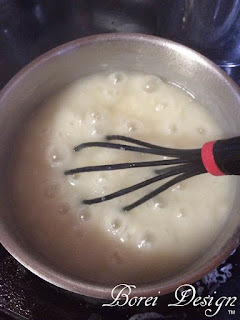 Beat this mixture briskly to remove lumps. Once your pot of water is boiling, slowly stir in salt (helps to combat mold & mildew) along with water and flour mixture. Mix well and let it boil for 2 - 3 minutes, stirring constantly. 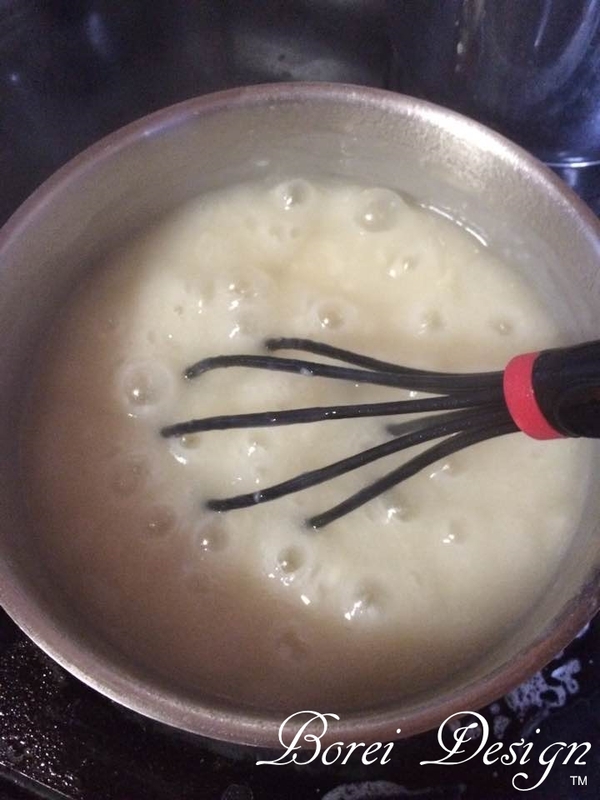 Mix to a gooey glue-like consistency. Add more flour and/or water as needed to achieve desired consistency. If you make more than you will use in one day, be sure to store excess in the fridge overnight. When ready for reuse, heat and add additional water to thin and smooth if necessary. I had no idea salt went into paper mache paste! Honestly I have not done mache since my kids were small and I can not remember if we put salt in the paste or not. 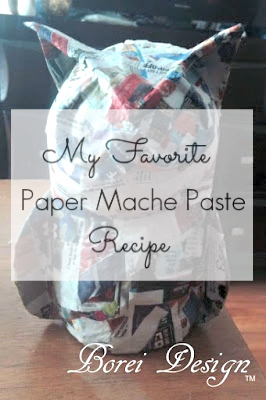 Funny thing is, recently I wanted to do mache again so now I have a good paste recipe! Thank you! I had no clue how to do this. I have always had to buy the paste at the store. Thank you for sharing this! I will be using it soon. I remembered the ingredients, but I did not remember the amounts. It has been years since I have done any papier mache crafts. I think part of the reason is that I recall just how messy paper mache projects can be! We used to make it when I was a kid and I still remember the mix of ingredients well. Good memories here. Hello! i am just wondering if paper mache recipe would work for what i am trying to accomplish! Hi Brittany and thanks so much for stopping by! That's a great question but I'm not sure paper mache would work on origami simply because the paper is so thin. Unless you can figure out a way to reinforce the folds with some type of heavy cardboard you will most likely end up with a gooey mess of paper. Spraying the origami with a acrylic sealer might work. You can apply as many coats as you need. That's a really good idea. I would fold something small of no importance with whatever paper you use and test it out on it. Clear enamel spray paint my work as well. 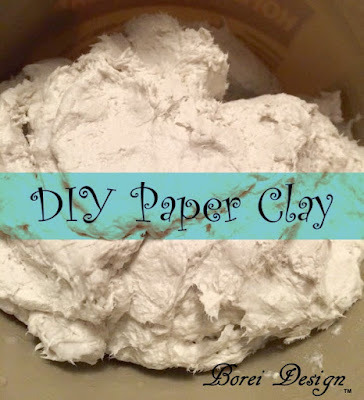 You mentioned covering the base form with paper clay....Do you have a recipe for the paper clay? Boiling it makes all the difference to me. I used flour and water without boiling as a kid and this seems a lot stronger probably because the flour mixes better. Hi, I want to try this rather than the powdery Elmer's stuff. How many layers do you suggest using for an art project? How long should I give it to dry? I would suggest at least four or five layers to make it solid. Just make sure it's dry to the best of your knowledge between layers by touching it and looking at it. Can you use,oter paper besides news papers? Like toilet, tissue, paper towels,or computer paper? It has been a long time since I have done this. I've used paper towels for fine details. The tissue paper I would suggest you use instead for paper clay. Computer paper may work but you are really going to have to soak it to get it to break down into the project well which will increase your chances for mold. I've also used really thin, cheap wrapping paper. It works really well. Hope that helps! Thanks so much for stopping by. At what temperature do you use the paste? I am looking at doing some paper mache with my kids but wouldn't want them to use the paste boiling hot. Is it good a a cooler temp after it has boiled? Hi Aja you can most DEFINITELY let it cool prior to use. No one can use it boiling hot. You have to let it cool first. It usually cool to room temperature and be ready for use fairly quickly.